Hermione is also my favourite character, and my two favourite books are The Goblet Of Fire and the last one [Deathly Hallows] I think it is a very good idea to read the books before watching the movies! Yeah, I didn’t want to discover what happens in the story via the movies… I wanted to know from the books. My husband is also reading along but he’s reading each book after we watch each movie… which means he seems to be enjoying the movies more, but I’m still glad to be doing it this way. Every time someone is reviewing Harry Potter on their blog I have this urge to pick up the book and re-read them. I am still planning to buy the books in english once and re-read them all as I read them in Dutch the first time. I really love this series and devoured the books. I think book 2-4 are my favourite. They really start getting long by this point. I also really like Hermione as a character. I can’t remember much of the movie, although i did watch it, I do remember that I thought the dragon battle was a bit weird as it wasn’t like the book at all. I was one of those people who kept pointing out the differences between the book and movie. Great reviews! I bought the whole series through Scholastic’s website for a pretty decent price, if you want to check there when you’re ready to buy! I do agree that the dragon battle in the movie was a weak point… all that property damage was definitely not in the book! Goblet of Fire is my favorite book as well! I love the sparring between Hermione and Ron in that one! Yes, I think the Hermione/Ron stuff in this one was really good! I also like her friendship with Harry, and how she’s always there for him even when everyone else has turned their back on him. 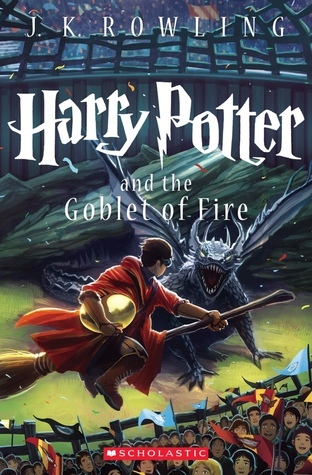 Goblet of Fire isn’t my favorite book of the series, but it’s definitely within the top 3, sometimes top 2, depending on the day. My top 3 are Prisoner of Azkaban(always #1), Deathly Hallows, & Goblet of Fire. I waver on which to place at #2 and which to place at #3. But GoF is just SO a turning point in the series, and you can tell. Harry Potter has never been completely lacking in seriousness(I mean, the books start with the death of Harry’s parents, so you KNOW that it’s gonna be grim at times) but GoF, for me, is when things really start amping up. It’s when the storm that’s been brewing finally starts, and I love it. Strangely, though, I really dislike the GoF film. 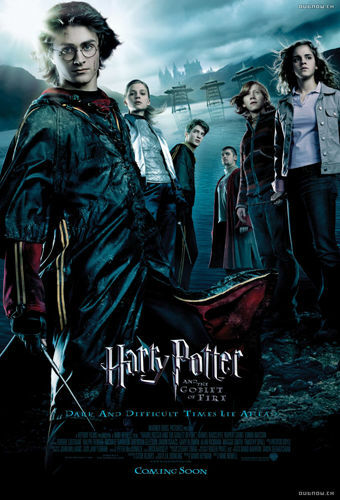 It’s been years since I’ve seen it last so I don’t remember exactly why I had that impression, but it’s always been the most boring HP film for me. Yes, it is definitely amping up now! And I love hearing how everyone ranks the movies and books! I’m really anxious to see how I’ll rank them all when I’m finished. How exciting to be reading the books/watching the movies for the first time! It’s been a while since I’ve read the books (especially the earlier ones), but over winter break I had something of a Harry Potter movie marathon, and it was magical. The series really does take a turn at the 4th book, because it’s where the over-arching series plot finally starts to pick up (at the end). The 5th is where it really starts to turn serious though! Oooo, you did just make me excited about the next movie and the ones after it! Yay! Yayyy! I’m so happy that you love this one, Goblet of Fire is my favorite book, and maybe my favorite film (I am torn between a later film though). I really loved the competition aspect in this book, and of course the ending is so emotional. The books are definitely amping up, it will be so interesting to see what you make of the next book. Yes, the ending just really got me! I’m definitely looking forward to MORE! yay!! This is definitely my second favorite book (I like Deathly Hallows quite a bit). And as I’ve said before, where I really feel the story turned and got interesting. The last act – it’s all so interesting and intriguing and good in many ways. I agree that the beginning of the film could have used a bit more around the World Cup and Dark Mark stuff. I also would have liked… at the end I just don’t love Daniel Radcliffe’s performance after… when he’s back. It’s just never felt really, as authentic or powerful as I wanted – as I feel the story warrants. I feel like if the director had just given him a little more time… helped him get to that place a little bit more… it would have been great. But every time, no matter how much I want to love this movie and do love so many other things about it, i cringe. The ending of the movie definitely wasn’t as dynamic as the book, I can agree with that. In the book I could just feel how exhausted and haunted Harry felt… not so much in the movie. I don’t know why it doesn’t get more love! I thought it definitely better than Prisoner of Azkaban!